When thinking about data in the development space, images of field workers talking to their stakeholders — farmers, nursing mothers, and community meetings — and collecting authentic data through tablets, smart phones, or pen and paper come to mind. However, for many NGOs, data collection is often quite different. Many NGOs collect data primarily for use in funding applications. Yet the funding space is competitive and can seem tricky to navigate, especially for a small organization that may not have the resources to dedicate an entire department to evaluation and grant writing. In the process, NGOs may feel the need to run poorly-designed surveys (for the sake of having data), inflate their numbers, or spend money on monitoring systems that are above their organizational capacity. Ignoring good data collection and evaluation design is detrimental both to an NGO’s stakeholders and its ability to compete in the funding space. What techniques can small NGOs, where time and energy are extremely limited commodities, use to improve their ability to attract funders? Below, we’ll take a look at best practices by top organizations across the Indian development sector and how these best practices can be translated into proposals that grab fundraising agencies’ attention and translate into higher funding. It is impossible to design impactful programs without a clear understanding of needs. As an NGO, understanding your stakeholders is the first and arguably most important step of your work. If you can demonstrate to a funder that your programs are grounded in community needs, your proposal already begins to stand out. NGOs that attract grants understand their constituents, as well as dynamics that may complicate accurate data collection. As Dr. Alka Srivastava of Development Alternatives explains, “In your stakeholders group there will be different stakeholder groups, and in each stakeholder groups there will be different layers and levels who you need to talk to”. Keeping these layers and levels in mind when designing data collection is crucial. According to Dr. Srivastava, “When there’s an orientation group for surveyors or when the team sits to see who will be our target from whom we are going to take data, those are important meetings because, at that point in time, we decide among ourselves that… the information has to be from different segments and we fix proportions for that”. For example, if you are focusing on early childhood feeding practices by mothers, your focus will be the mothers and their feeding techniques. However, interviewing mother in laws, husbands, and other influential people in the lives of the mothers, as well as leaders in the community, helps to contextualize and frame your questions in the broader context of the women’s lives. Once you identify all of the stakeholders you would like to interview, your team can assign proportions to figure out how many people you’d like to interview in each category based on research priorities, time, and other organizational factors. Framing and contextualizing your data collection can provide critical clues to why certain behavior patterns exist or raise red flags if information by certain respondents needs revisiting. Use a data collection team that is familiar and normal to your stakeholders’ everyday lives. The Development Alternatives team advises, “You have to use triangulation to ascertain whether you are getting the right response. Sometimes the expectation of the respondent influences the responses you are going to get. If you go and talk to a farmer, if they sense you are here to provide a benefit, they always down play their incomes, so you have to use triangulation and ask different questions”. If a question is asked by a well-trained local surveyor, the potential for a genuine conversation emerges. In addition, local surveyors who understand the context in which your stakeholders are operating, frequently better understand the nuances of language, patterns in the community, and local traditions, and can therefore tailor the way a question is formed, or follow up on bits of information that may seem insignificant to an outsider but is crucial to understanding the local context. For example, if speaking with farmers on their experience with rainfall patterns in the past 10 years, a local surveyor that already understands traditional patterns of agricultural practices in the region, and how these patterns have changed or stayed the same, can use that information to ask questions in a manner that reveal a broader pattern of systems change then just a change in rainfall. As Avani Kapur of the Accountability Initiative says in response to their data collection, “We actually go to the field, collect data, through local volunteers. It’s not like we hire a survey agency sitting in Delhi. It’s local people that are trained and used to collect data”. Remember, good data collection takes time. Both Development Alternatives and Accountability Initiative mentioned the importance of strong local partners. Be ready to revisit questions and sample check the data if needed! What happens while conducting surveys if answers from certain stakeholders challenges the ideas held by other groups? Dr. Srivastava urges that redefining and reshaping data questions is just part of the data collection process. “ …They may be controversial views, there may be conflicting ideas coming forth, but it is the team that has to decide based on the data… Visiting and re-visiting the field and re-deciding based on these existing dynamics…these kind of things have to occur, and the sampling is done accordingly”. CSR funders evaluate project proposals with a special eye for proposals that align with their focus area and project themes, as well as the technical and financial aspects of the grant proposal. If your organization has limited scope for fundraising, you should look for funders that have historically funded projects similar to yours. Stay narrow and specific. Show that you are competitive in your specific area. Avoid applying blindly to all agencies with open calls for proposals. Funding is crucial, but stay focused on your organizational goals. Demonstrated work in a specific area will greatly improve your eligibility for certain grants. Everyone runs to the big donors, which means more competition for their funds, coupled with the real possibility that they don’t fund projects in your area. Keep an eye out for small funders that you can build relationships with while staying true to your organizational goals. No matter how small an organization you are, you must make developing evaluation and reporting systems a priority. The emphasis placed by CSR funders on existing internal systems means that NGOs interested in being competitive for funding must think about developing strong internal reporting systems and M&E mechanisms. These allow funders interested in your work to really understand how everything you do fits together. There are a number of fantastic (and free!) resources out there to help guide your organization in developing effective internal evaluation systems. You can learn more about qualitative and quantitative research here. Read about successful focus group discussions (like the one mentioned by Development Alternatives above) here, and sift through various forms of data collection methods here. Be ready to explain your internal systems including financial reporting, monitoring and evaluation, and internal reporting methods. Funders need to know that your NGO will provide a return on investment — in this case, translated as lives impacted and communities changed. Be prepared and ready to answer questions about your internal financial reporting, in addition to overall monitoring and evaluation techniques and reporting methods. While it may be daunting as a small organization, focusing on your own processes is a huge part of effectively working for others. One of your most important jobs as an NGO is to diligently and intentionally understand the needs of your stakeholders and figure out how to effectively present these needs to funders using grant proposals. This process takes time, patience and refinement. However, taking the time to build your project evaluation systems and reporting systems pays off for your stakeholders, organization and funding options. It’s like the adage “Invest in yourself first”; except, instead of investing in sleep or personal savings, you are investing in strong organizational monitoring and evaluation and potential future funding. It’s a foundation to rest easy on. 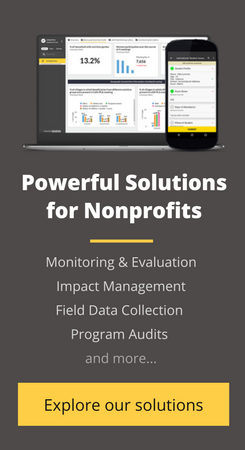 Read more to know why funders are increasingly demanding data before giving out a grant to your nonprofit. We know that collecting good quality data is the first step towards data driven decision making. In the last two years, we’ve helped over 150 partners collect over 20 million data points through our mobile data collection app, Collect. We love Collect, but we realize that building a product isn’t enough. We’d are excited to share the lessons we’ve learned on designing a stellar data collection plan through our first ever ebook. This 30-page guide contains everything you need to know to improve the way you collect data. Download it now! Be it a small or big NGO best practices remains the same for each one. Best practice will make them enhance their company further. I agree with you that understanding the constituents for grant proposal is the best practice.